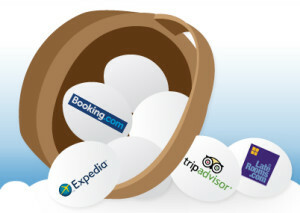 Are all your eggs in one Online Travel Agent’s (OTA) basket? We see a number of independent accommodation owners who rely on just one OTA. Business wisdom and common sense suggest that an over reliance on one source of sales is risky. Spreading your sales sources will give you a more reliable, robust and diversified stream of bookings. So what are the risks of working with just one OTA? At some future point that company may decide to implement something you disagree with; it could be a policy about commission or some way that they deal with guest data, reviews or customer relations. There’s no way to say what the future holds but with only one source you will have to follow their rules without any backup relationships. Each of the biggest three worldwide travel websites (and they keep growing), Expedia, TripAdvisor and Booking.com all have their own customer databases and their own advertising strategies. By working with more than one you both maximise your exposure and diversify sources of potential customers. Remember that some customers only ever book with Expedia and others only Booking.com so by working with both you get seen by them all. Customers also visit many websites during their research process so featuring on the big three means you have more chance of catching their eye. Again each of these booking sites will place a different emphasis on your property so you will appear in different positions and places on different searches and pages. Having only one OTA is a bit like a farmer getting a giant contract from a major supermarket. The initial glow wears off when you have had to turn down all other distribution opportunities and tailor your processes to that single source, and then you realise that losing the contract would likely mean instant business failure. It’s a horrible question to ask but an important one, if your biggest OTA stopped working with you would your business survive? Fortunately in the accommodation business you can spread your risk far more easily than some farmers can. You can share your availability across multiple channels and benefit from a bigger and more diverse spread of bookings whilst increasing your negotiating position. Then, if at some future date one OTA ever demands something you don’t want to give you can always move business to another. A good healthy business mix includes plenty of direct bookings so your OTA policy should always go hand-in-hand with a strategy to increase direct bookings. In our next blog we cover ways to increase direct bookings, so you can make the most of the existing customers that have booked via the OTAs. I fully agree with all you are saying, however here in the real world Booking.com have a near total monopoly and the others do not get a look in. Tourist Boards are a lost cause, Laterooms requires massive up-dates and others charge way too much commission. Use OTAs as an introduction then try get customers to book direct on the next visit. I do not have a website and do not intend to have one. Can Free To Book help me? Hi! At freetobook, we provide softwares related to your website to get more direct bookings, an easier organisation, … Basically more bookings and less worrying. I’m afraid that if you do not want a website, we don’t have anything to offer you. However, if you choose to get one, don’t hesitate to get in touch and we will see how our services can help you. many people think like you, because they are convinced, that having a website means to employ specialised people for that and having to pay lots of fees and living in danger of whatever could happen. I would love to find out more about your channel manager. I notice you mention Expedia…we already get bookings as you know from Booking.com and LAte Rooms. Is Expedia like them? Do we have to sign up. What about Trivago also? We have tested TA and Agoda to try to get more clients in low season …. with little impacts. Seems they are good at bringing new clients in high season only …. when we don’t need them !!! Very interested in alternative advertising channels. Since couple years, I wanted to switch to Freetobook for all the benefits you offer; but can’t achieve this wish. Please help me to become one of your business partner ASAP. Hi, sorry for the delay ! Why can’t you achieve it ? Give us a call at 0141 270 2173 or email us at info@freetobook.com if you want informations or to find out more about the services we can offer you. I agree entirely. I was hoping that when I joined Freetobook that Expedia was available but I think there is a problem with the connection, could you update me on progress. All of your Freetobook emails with advice are so very helpful, thank you. I look forward to reading more. We are fully connected to Expedia, you can activate it in the Tab “Plus” if you wish to connect to Expedia. Interesting to think of spreading our ‘risk’ over more than one main OTA … and I am debating this point of view. I’m just wondering if focussing on one main OTA (that is big in our area) is better (we have more / better reviews so ‘higher’ on their listing) – or to split bookings with another OTA and not rate so high in either listing … mmm … food for thought. I will do some exploring though, so thank you. Also – will be interested in your next blog re encouraging direct bookings … no doubt this is definitely an area to focus on! Thanks for your help – we’ve been using the Freetobook channel manager since beginning of this year and have been delighted.